Easter: Demeter, Persephone, Ishtar, Ester..etc..... Easter‏? - ThaBadbrey Herbal. You are about to read a Spiritual/Philosophical Newsletter. This issue dealt with the so called “celebration” of what is known today as “Easter”, and was emailed to a few friends and family Members in early January 2009. Demeter, Persephone, Aphrodite, Hathor, Europa, Isis, Semiramis, Ishtar, Ester, Eastar etc…….. Easter‏? You Are About to Read a Badbrey Newsletter.. I have studied vasts amounts of information (outside of my mainstream educational studies) for over ten years now. During this time I have covered a wide range of subjects in great detail, to the point where a lot of this knowledge is now “second-nature” to me. I have thus, decided to share this “gnosis” (for want of a better expression) in the form of theses newsletters. This issue deals with the origin of the well known celebration of “Easter”. First of all, the date of this so-called celebration depends on when it falls. “Easter-SUNday” is the first Sunday after the “Paschal-Full-Moon”. The 14th day of this Lunar month is known as the “ecclesiastic full moon” and falls on or after 21st March (depending on the moon table calculations). March 21st also marks the beginning of Spring in the Northern Hemisphere while in the Southern Hemisphere, it marks the beginning of Autumn. This is known as the ecclesiastic “vernal equinox”. As far as I am aware, it is common knowledge that Spring is the time when the trees begin to blossom on their arrival to life as they rise from the “dead” of the winter period. As well as the birds building nests as they ready themselves to lay eggs and rear young. A great many, in fact nearly all animals give birth to young during this time. In ancient times, us human beings used to follow this “cosmic-law” but it was altered when we became “civilised” ..lol. It is for this reason that various deities where chosen by ancient native people all over the world to represent various celestial events. In this instance, to coincide with the natural “cosmic-law” of reproduction, replenishment and new-life, various names were given to deify the personification of the event in question. It is accepted by researchers and historians that many ancient peoples chose to represent this event by using the form of a female archetype or goddess. I will give reference to one example of the intertwined relationship of the goddess, known as Ishtar to the Sumerians, with the celebration of “Easter“. Ishtar, also known as the Moon Goddess (The moon being a representation of the female creative energy from ancient times) , was their chosen representation of the celestial phenomena taking place at this time (Vernal Equinox/Spring in the Northern Hemisphere). She was the goddess of Love War and Procreation. In the story of Ast/Auset/Isis, her husband Asar/Ausar/Osiris, who was symbolic of the sun, was killed by Seth or Set. Set was associated with darkness (part of the etymological background of the term Sun-Set) and evil, he cut Asar/Ausar/Osiris into fourteen pieces and scattered them. However, Ast/Auset/Isis found 13 of the pieces and was unable to locate the 14th…etc. 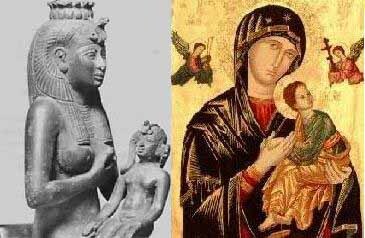 To cut a long story short, she gave birth to Heru/Horus who was the sun, sorry, i mean son of Asar/Ausar/Osiris. Heru/Horus was also representative of light, the sun and was also god of the sky. This story is an allegorical tale of the journey of the sun. The above link shows the Christian pictorial version of the story of the sun (Notice the Halo behind Jesus’ head as well as that of Mary. This Halo is representative of the sun), however this is not taught in that format in christian schools or churches. It is also not taught that the story of Jesus and Mary is a “remix” of these earlier tales either. What is also disappointing is the fact that “Atheists” would use this to dispute that the whole story surrounding “Easter ” is “make believe“, which I find equally erroneous. The story that most are familiar with of Jesus being crucified and appearing to his mother, rising on the third day is but another version of these many tales which are told cryptically and allegorically to conceal the explanation of the movement of celestial bodies and the effects they have on the planet exoterically as well as esoterically. The above reference is in fact a reference to the celebration that I have explained already, at that time (If the Bible is to be taken as historical documentation) it had nothing to do with Jesus as Easter is a translation of the word “Pesah” which, literally translated, means Passover. In 1611 AD when the Bible was first translated from Latin to English, this word was replaced with the word “Easter”. Those in control of the paradigm of “Christiandom” will not admit that their “Easter-Story” is but another remix of those of old. They prefer to instead “convince” followers that the story is a formulation of entirely Christian Origin and that to question it is to question God himself and to therefore risk going to hell for ETERNITY, thus so allowing people to remain “dumbed-down” as to the true origin of “Easter“. As far as I am concerned, if the intention is to turn this celebration from a form of “Pagantry” ..lol into a fully Christian (which also falls into the category of Paganism) celebration of Jesus’ death and resurrection, then the term EASTER has no business in being used within the Christian church as it is misleading followers into blindly taking part in the celebration of fertility and the goddess Ishtar/Eastre/Europa etc…! In conclusion, Easter is a celebration which took place across the whole of the ancient world in an attempt to explain, through deification and via cryptogram and allegory, the movement and effect of the celestial bodies on this place we call real-ity. The physical explanation of this is the journey of the sun and the moon where their said cycles effect the growth and life cycle of life on this planet (Birds trees, animals seasons etc…). However, in addition to this FACT, there is also, concealed within these tales, the spiritual and esoteric nature of “man” and how we are continuously seeking to be reunited with the source of creation (Ether) itself, whom many refer to as God. I am in no way saying, “Christianity is wrong, The Church is Evil, Stop What You Are doing At Once etc”….lol. Individuals are free to carryout worship in what ever way they want. However, what I am saying is by independently researching subjects yourself, you are more likely to make up your own minds instead of falling prey to what I call my arch-enemy, DOGMA. Most individuals I come across continue to take part in a variety of practices and celebrational rituals although they have absolutely no idea as to the true origins of what they are taking part in and why they are doing it. To me, it equals = DOGMATIC BEHAVIOUR. When I pose, to such individuals, the question of why they actually take part in celebrating Easter and why they purchase Easter Eggs and Chocolate Bunnies, they usually tell me something along the lines of…”Because we are celebrating The life and death of Jesus, Eggs represent New Life”. While this explanation is not entirely incorrect, it is, when broken down critically in light of the information available on this subject, a somewhat superficial explanation as to what they are celebrating and why. Stay Tuned for more Badbrey Newsletters in the coming weeks……. You have just read a Badbrey Newsletter……Ha!